Sports car enthusiasts are still patiently waiting for the Project Black S coupe to get a production version using F1 hybrid tech, but Infiniti knows the real money comes from the crossover segment. For this reason, next month’s Detroit Auto Show will be the venue where Nissan’s upscale brand will introduce a fully electric concept set to provide a taste of things to come in terms of a broad EV portfolio. We only have this shadowy teaser image for the time being, showing a curvaceous crossover with sleek LED headlights and side cameras instead of conventional mirrors. 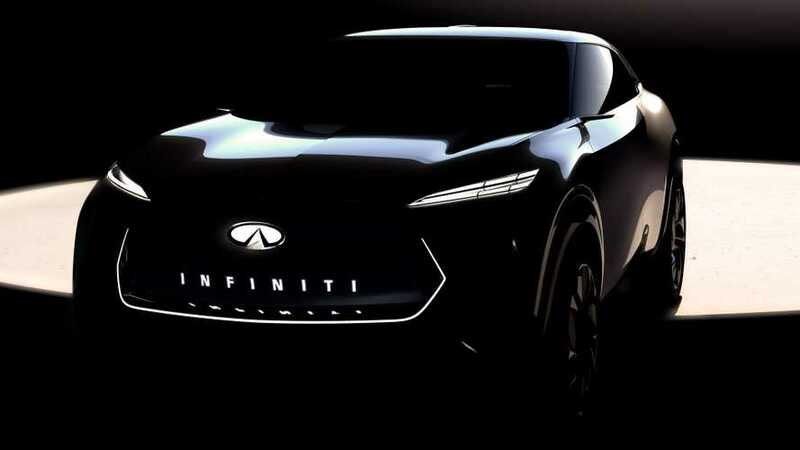 Both the Infiniti badge and lettering underneath it are illuminated, as is the outline of what would be a grille on a conventionally powered vehicle. Typical for a concept, the yet-unnamed electric CUV sits on a set of oversized wheels and doesn’t have any visible door handles. Although it may seem like a two-door vehicle at a first glance, look closer and you’ll notice the outline of the rear doors. A gently sloped roofline gives the concept a sporty appearance, which hopefully continues at the back. We certainly like what we’re seeing so far, and given Infiniti’s recent success with gorgeous showcars such as the Prototype 10 and the Q Inspiration, the new zero-emissions crossover should be quite a looker as well. We will have to wait until January to see it in the metal at NAIAS where the Japanese marque will celebrate 30 years of existence. The Detroit show will also serve as the place where the brand is going to present a new platform specifically engineered for EVs ahead of a planned electrification push scheduled to begin in 2021. Infiniti refers to the concept as a “future fully electric crossover,” which can only mean that it will have a production equivalent in a few years from now.